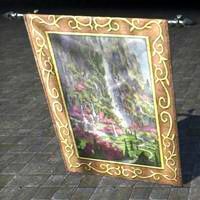 High Elf Tapestry, Water-Themed is a superior (blue) quality Furniture in The Elder Scrolls Online. Crafted, Clothing Station. Requires Pattern: High Elf Tapestry, Water-Themed. Patterns are found randomly in containers around Tamriel and can be traded and sold by players. Some special Patterns are only available from pickpocketing or as special rewards.